Hey guys! Today's little pause for thought is on confidence. I have never been a particularly confident person, I'm just naturally quite quiet and so confidence was something that I particularly had to work on but it has improved as I've got older. I know that to some people confidence comes naturally but to others having confidence isn't really in their nature. In my experience however confidence is really important, not only for job interviews when you get older, but in every day life. Something which I started to notice when I got older was that if you say something with confidence rather than timidly, people don't really say anything about it. For example if you say that you want to do something and you say it confidently, people are more likely to do it with you. Just the same as if you're arguing and you're speaking confidently you're more likely to be believed and respected. 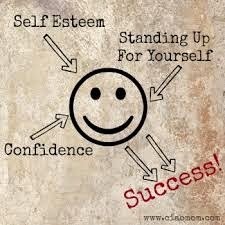 Confidence is really important to have, to be able to express yourself confidently is really needed. Think about times when you backed down from something but should have had the confidence to stand up for yourself. Would the situation had gone better? People that know me know that I like to voice my opinions a lot, something which I never used to really do. When I was younger I used to go along with what other people said but I started to challenge this and that actually my opinions are just as important. I am just as important. And that is what it boils down to. If you think you're more important than other people then that's arrogant. If you think you're less important, then you'll miss out on opportunities and chances to show what you believe in or to do what you want to. But knowing that you are just as important as everyone else will give you the ability to accept other people, do what you want to do and live your life a lot happier than if you didn't.